In 1927, Walt Disney had a hit with the creation of the character Oswald the Lucky Rabbit. Oswald was one of the first cartoon characters to have a personality not only displayed by his dialogue, but through his every motion in what would be called “personality animation”. But, instead of getting a budget infusion, producer Charles Mintz wanted Disney to take a pay cut. And, at the same time, he was scalping most of the members of Disney’s studio to form his own. Since Oswald was owned by Mintz’s distributor, Universal Studios, Disney was forced to leave him behind when he and those still loyal to him quit. Disney realized he needed a new character, as well as to retain the rights of any character created by his studio. After some trial and error with various animal characters, Disney and animator Ub Iwerks finally found their character: a mouse. They named him Mortimer, but Disney’s wife Lillian convinced them to change it to Mickey (Mortimer would be reused later for one of Mickey’s rivals beginning in 1936). Mickey resembled Oswald, except for the nose, ears and tail. Iwerks designed Mickey’s body entirely out of circles to make him easier to animate. His ears were initially animated with a realistic perspective, but it was decided to have them always appear circular no matter which way he faced to keep him instantly recognizable (which proved problematic for merchandisers when they had to create a 3D model of the character). Mickey was also given four fingers on each hand to both make them seem less cluttered and to save money on having to animate an extra finger in the 45,000 drawings it took to make a 6 ½ minute short. Eventually, Mickey was also given white gloves to contrast his hands against his body. 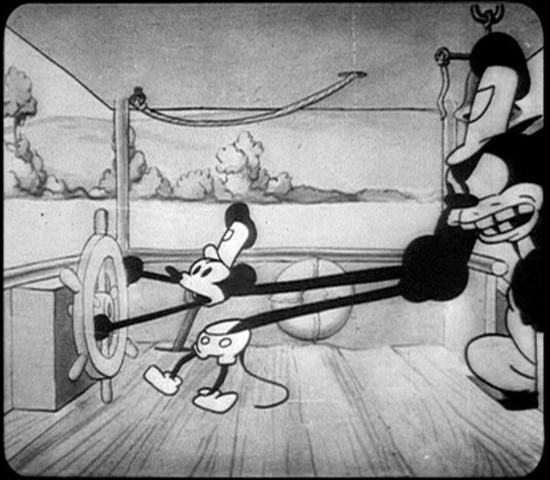 The rivalry between Mickey and Pete begins in Steamboat Willie. 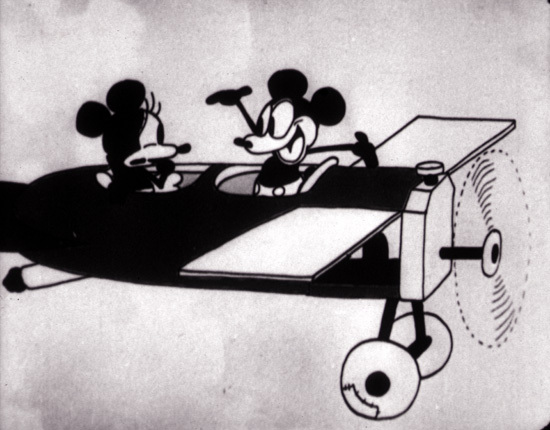 Mickey’s first short was Plane Crazy in 1928. It was a silent film that also introduced Mickey’s long-time girlfriend, Minnie, and the prototype for what would become Clarabelle Cow. It was produced in just two weeks with Iwerks being the sole animator drawing at a rate of 700 drawings a day. Although it was shown to a test audience that May, it failed to pick up a distributor. Mickey and Minnie’s official debuts came in the next short, Steamboat Willie, which also introduced Mickey’s chief rival, Pete. 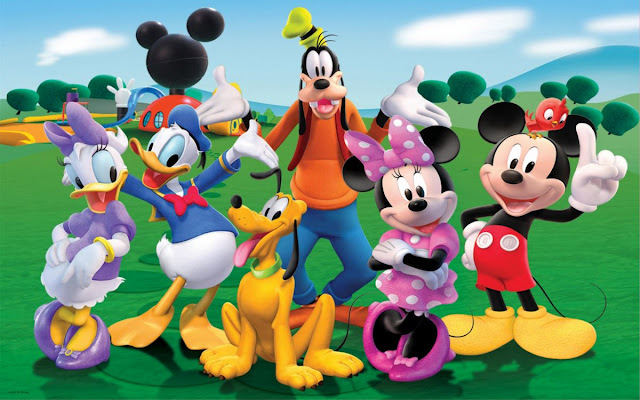 It was distributed by Celebrity Productions on November 18 and became the first Disney cartoon with synchronized sound, which included character sounds and a musical score arranged by Wilfred Jackson and Bert Lewis. Disney realized synchronized sound would be the future of film, and it was proven as it became the most popular cartoon of the day. Plane Crazy had sound added to it and would become the fourth Mickey short released. Mickey's 5th comic strip, part of an adaptation of Plane Crazy. Mickey’s popularity began to grow as he appeared in more shorts, voiced by Disney himself until 1947, newspaper comic strips and in comic books (such as the long-running Italian Topolino). Characters were gradually added to his universe, including Horace Horsecollar (The Plow Boy, 1929), his dog, Pluto (a prototype in 1930’s The Chain Gang, as Minnie’s dog in in The Picnic, and finally as Mickey’s in 1931’s The Moose Hunt), Goofy (as Dippy Dawg in 1932’s Mickey’s Revue), Mickey’s nephews in 1934’s Mickey’s Steam Roller, and Clara Cluck and the introduction of Donald Duck to the Mickey universe in Orphan’s Benefit. By 1935, the Mickey series went to color beginning with The Band Concert (however, he was first colorized in 1932’s Parade of the Award Nominees which was made by Disney Studios for the 5th Academy Awards). In 1938, animator Fred Moore gave Mickey a redesign, changing his body to have more of a pear-shape, his face a Caucasian tone instead of pure white, and shrank his eyes so that the black at the top of his face became akin to a hairline rather than an eyeline. Mickey’s popularity experienced a slump after 1940, but kept appearing in shorts until 1953’s The Simple Things. The core Disney gang: Daisy, Pluto, Goofy, Mickey, Minnie and Donald. In 1954, Mickey made the transition to television as part of Walt Disney’s Disneyland anthology series, and then the following year with The Mickey Mouse Club where Disney resumed voicing the character. This saw a resurgence in his popularity, especially as his classic shorts were released to air on television. In the years that followed, Mickey appeared in feature films and television programs, as well as made cameos in various Disney productions. He became the mascot of the Walt Disney Company, which led to the alteration of his personality from a cheeky, lovable rogue into more of an all-around nice guy. This squeaky-clean version of Mickey would remain until 2009, when Disney decided to try and rebrand the character by bringing back some of his original mischievous side beginning with 2010’s Epic Mickey. Mickey and his friends enter the third dimension.